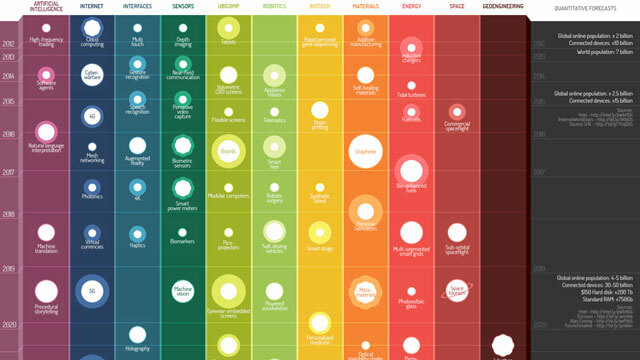 An infographics predicting the potential future of technology development until 2040 has won the Silver Award in the Infographic/Infodesign category at the Information Is Beautiful Awards 2012. The interactive infographics ‘Envisioning emerging technology for 2012 and beyond‘ was created by Michell Zappa a technology futurist and founder of Envisioning Tech. Zappa researches and presents about technology innovations. He prepares information in an easy-to-understand way for less tech-savvy audiences and draws a bigger picture of the direction in which technological development is leading our society. Unfortunately he also is sort of a surveillance evangelist who presented some potential future surveillance scenarios at the 2012 Global Futures Forum (GFF is a strategic think-tank working with the private sector and governmental intelligence organisations.) The video below is nonetheless interesting, altough the audio is horribly distorted.